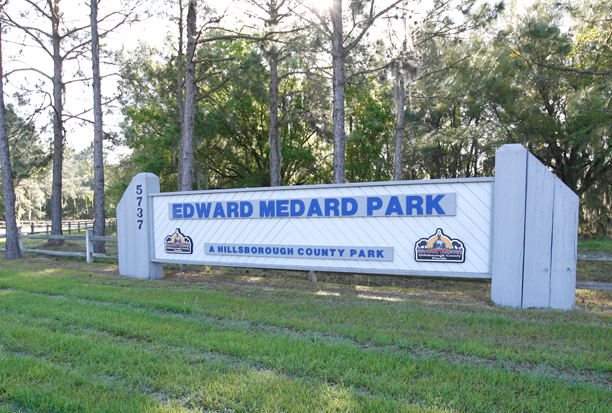 The scene is very different this spring at the 1,281-acre Edward Medard Park, which hosts a 750-acre reservoir and welcomes close to 500,000 visitors annually, featuring fishing, camping, swimming and picnicking. Thanks to a major $2.3 million construction embankment repair and park restoration project, dump trucks and bulldozers, along with heavy-duty cranes, have replaced the swarm of boaters and fisherman who usually take advantage of the park’s many amenities. Fortunately, according to Southwest Florida Water Management District (Swiftmud) officials, the wait to refill the almost depleted reservoir will soon be over. “The project is going well and [we] should be on schedule to finish the work inside the reservoir by May 30, 2010,” said Swiftmud Field Operation Manager Jeff Hagberg. Hagberg explained that workers began draining the reservoir last October, a project that was completed by December 31, 2009, but mentioned that, of course, while the draining took just a couple of months, it will take much longer before the park is back to normal, as the agency plans to allow nature to get this portion of the project done. “Hopefully the reservoir will be back to its normal state within one year, but it could take as long as two years or as little as six months depending on rainfall,” Hagberg said. Of course, a lot of good has come from the project. The park itself has been busy with camping and other daily activities, as long as visitors made sure they had their park fees ready. There has been an increase in bird populations such as White Pelicans and many other species as the low water levels, which in most areas were only 4-5 feet, allowed the birds to feed easier. Some of the other positive effects of the construction came in the form of fish replacement and recycling projects. As the draining progressed the Florida Fish and Wildlife Conservation (FWC) and the University of Florida relocated bass and speckled perch to other lakes in Florida and harvested more than 4,000 lbs. of fish from the reservoir. More than 1,300 tilapia and catfish have been filleted and donated to America’s Second Harvest. The district also built fish attracters under the direction of FWC by using material removed from the deteriorated existing embankment and approximately 8,000 tons of recycled concrete gravel is currently being used as part of the new construction. While park enthusiasts may have to be patient just a bit longer Hagberg emphasized that the overall project has been good for the park as well as the wildlife, which seems to be benefitting. For more information about the construction and the sirens in connection with the Medard Park Reservoir, please visit www.watermatters.org.